In his wedding toast, Kevin instructs Kate, Randall, and Rebecca to finally release the deep breath they’ve been holding since Jack died — and I think we deserve to release a deep breath, too. Season two of This Is Us has been an intensely sad one, much more bitter than sweet: Kevin hit rock bottom, Randall experienced the highs and lows of fostering, Kate had a miscarriage, and we had to watch the night of Jack’s death in heartbreaking detail. It’s been a ride, you guys. 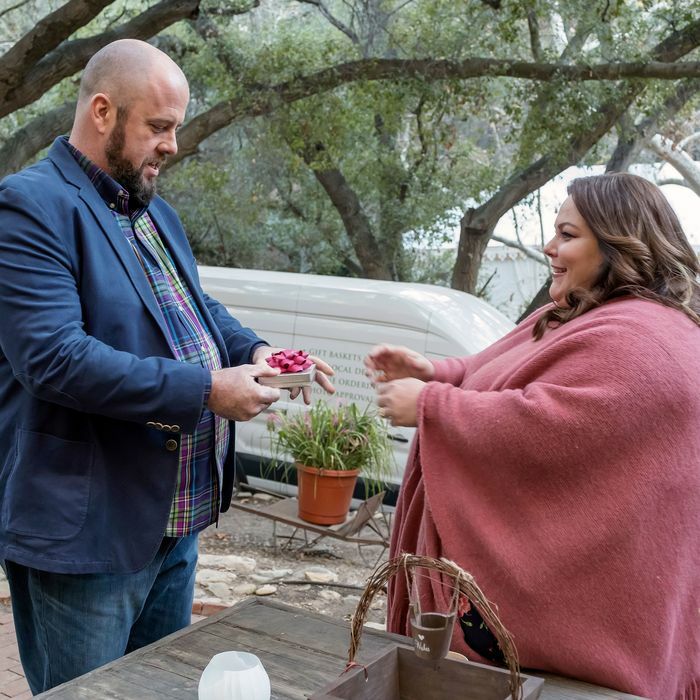 So, it’s nice that This Is Us ends the season on a mostly high note (oh, we will discuss the things), or at least a cathartic one. There is dancing and love and there is cake. We deserve the cake. The great Ka-Toby wedding is finally upon us. The venue? The family cabin. Everyone seems the appropriate amount of stressed. Toby is concerned both with the impending arrival of his (always-feuding) parents and making sure Kate doesn’t get too overwhelmed with all the Jack feelings the wedding is sure to bring up. He doesn’t need to worry, though, because her brothers have it all under control. Seriously, whoever decided that Kevin and Randall would be Kate’s wedding planners is a genius. From the moment Kevin was on the phone reaming someone out for not having the gift bags ready and saying, “Don’t justify it, fix it” to Randall, I was very much in. More than that, this episode, while containing the requisite amount of bittersweetness, is easily the show’s funniest. More please! The first major emergency Kevin and Randall need to tackle is keeping Kate calm once she realizes that Toby forgot to pack her “something old.” It was supposed to be Jack’s Daytona Beach shirt. Do I buy that Kate would leave something so important up to Toby to take care of? No. However, it leads to Kate screaming, “I know I’m weird, Randall!” in a scene that feels so true to these siblings, it’s almost like they are teens again. Everyone knows that this day will be hard for Kate. Poor Rebecca feels like a walking reminder of Kate’s loss. She plans to stay out of Kate’s way for fear of upsetting her simply by breathing. When Kate runs off the morning of the wedding for an “errand” and is gone for hours, Kevin and Randall are on it. They hit up all of Kate and Jack’s old haunts in an effort to find the bride. On the way, they play a super-fun and not-at-all-terrifying game that Randall and Beth invented called Worst Case Scenario: You say all the things you are scared could happen without any judgment, just to get it out of your system. Again, this scene has the perfect mix of sincerity (did Randall get too absorbed in his own life and abandon his sister? Did Kevin allow Kate to spend her time taking care of him instead of taking care of herself? Did they both fail as brothers?) and humor (no, Kevin does not feel better after playing this game, Randall). Kevin and Randall just miss Kate at the old ice cream shop where their dad used to take her. Since she doesn’t have the T-shirt, she was going to honor Jack by serving his favorite flavor of ice cream at the wedding, but the place has changed. Since that won’t do, Kate drives on, attempting to deal with her Jack feelings. She ends up calling Rebecca. You see, Kate’s been having this dream, a dream we’ve seen throughout the episode: The Pearsons are all up at the cabin for a wedding, but this time, it is Jack and Rebecca renewing their vows on their 40th wedding anniversary — what might have been. Yes, we finally see Old Jack! Old but still dreamy, thank goodness. It’s a little manipulative, but worth it to see Jack and Kate get to share a dance. Rebecca does her best to remind Kate that weddings stir up emotions, but she also makes Kate realize that Toby isn’t in that dream. Isn’t that weird? This sends Kate off to her next locale: the tree stump in the woods where she’d sit and talk to her dad. She honors that tradition, this time bringing Jack’s urn with her (because she planned to have Urn Jack at the wedding). She tells her father that she’s been hanging on to the memory of him too tightly, for too long. She needs to make room for Toby. She finally scatters her father’s remaining ashes. When Kate walks back to her car, her brothers are waiting for her. They’re proud of their sister, who is now completely ready to get married, and proud of themselves for being such great brothers. The Sterling K. Brown and Justin Hartley Comedy Duo is tremendous. Kate isn’t the only one dealing with wedding-day drama; there’s also Toby and his parents. (Wendie Malick and Dan Lauria? Bless you, Dan Fogelman!) They never agree on anything, but neither of them think Toby should marry Kate. They’ve watched him bend over backwards to keep her happy and not “set her off”; she’s unstable, and they are worried. They remember the deep depression Toby fell into after his first failed marriage. They remember the missing work and the drawn curtains and the hiding-under-the-covers. Toby basically tells them to get on board or get lost, but, like, it would behoove us to remember what they had to say. There’s also Deja drama. Since her mother asked to be stripped of all parental rights, Deja has been less sullen and more angry. Really angry. And mean! Randall and Beth are in the process of adopting her permanently, but they have no idea what to do with this new version of Deja. Enter Zoe, Beth’s cousin and the wedding photographer. It’s about time we met some of Beth’s family, and Zoe doesn’t disappoint. Isn’t it amazing how This Is Us introduces new characters that feel as if we’ve known them all along? That’s Zoe. She gets Deja alone and tells her own story: Her mom left her with Beth’s family when she was a little kid and never came back. She spent a long time taking out her anger on Beth’s mom and Beth, until one day she woke up and realized that it didn’t make sense to hate the people who loved her. The story is enough to make Deja put on a dress for the wedding, but not much else. Beth will take it! Finally, the wedding is upon us. Kate and Rebecca share a wonderful scene that brings their season-long journey full circle. Standing there in her wedding dress, Kate (Chrissy Metz looks gorgeous, by the way) tells her mom that all she’s wanted is to be like her: a musician, a mom, in a marriage like hers was. Rebecca isn’t in Kate’s way. She is Kate’s way. If you can still see through your tears, you’ll see a wedding montage cut with a conversation Jack and little Kate had about her marrying some lucky guy one day. Oh, it’s so lovely. If you haven’t figured it out by now, any time Jack says “Katie-girl,” my Pavlovian response is to cry. This show has ruined me. Kate’s brothers walk her down the aisle, and Kate and Toby say “I do,” and everyone is just so happy. A little too happy for this show, if you know what I mean. Toby’s mom comes up to Deja, Tess, and Annie, commenting how much Tess and Annie look like their mom and how much Deja looks like her dad. Deja gets angry and leaves. Then Kevin gives his aforementioned toast. (Most of Kevin’s toast is about Kevin, which feels on-brand.) The letting-go-of-things, breathing-exercise portion is probably weird for the majority of guests, but it’s exactly what Kevin, Kate, Randall, and Rebecca need. What really gets me is when Kevin talks about making this day special because that’s what their dad would’ve done. He calls her Katie-girl, so, you know. Randall follows him. His speech is a little about him, too (if we’re being honest, also on-brand): It’s about how he loves control but has realized we have no control over the future, only who we go there with. And that’s when This Is Us deploys its new trick: We jump into the future again. It’s a year-ish from now. Kevin is on an airplane headed to Vietnam with a picture of Jack from the war … and Zoe snuggled at his side. Yes, Beth’s cousin Zoe. (Back at the wedding reception, we see Kevin and Zoe have a meet-cute by the punch bowl.) In the future, we also see Kate going to Toby’s side in their bedroom, and the curtains are drawn and he is hiding under the covers as she talks to him about changing his meds. It’s just like the depressive episode his parents described. Back at the wedding, Randall and Beth realize Deja is gone. We find her outside the venue with a baseball bat, smashing in the windshield of Randall’s car. We flash forward, this time back to Future Randall and Older Tess. They seem sad (I know, I know, they’re Pearsons), and Randall tells Tess, “It’s time to go see her.” Older Tess isn’t ready. Future Randall says he isn’t either. The scene is edited in such a way that makes you assume they are talking about Deja, but remember: We have been burned by assumptions on this show before. Still, what an ominous note to leave us with. Until season three arrives, speculations are most welcome.